T & I GLOBAL presents SMART AXIS Fully Automatic Chasing machine – Unique concept developed through continuous efforts of our R & D Team. 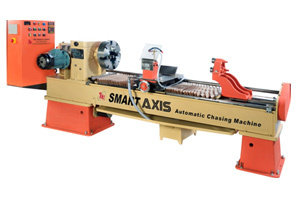 SMART AXIS is a fully automatic chasing machine suitable for all sizes of CTC Rollers – 8.25” to 13' Dia and 30” to 52” Length. Both 8 TPI and 10 TPI chasing can be done using the normal 1” or 2” wide Chasers. FULLY AUTOMATIC : Just set the CTC roller on the machine and start! SMART AXIS can be operated with semi-skilled operators with basic training. All functions such as Tool feeding, Retracting and Resetting are performed automatically. No need for highly skilled operator to achieve good quality chasing – job done automatically. PRECISION SHARPENING : Quality of Chasing is much superior due to minimum dependence on operator skill. Accurate Chasing results in better cuts from CTC machine; also the heat generation is reduced. MAINTENANCE : SMART Axis is simple and easy to maintain. Gears, Pinions & Bed are high precision and made from special steels to ensure long trouble free performance. DRIVES : One Single motor operates both forward and reverse travel. OPERATIONAL ECONOMY & SAVINGS : Only ONE operator can handle both Chasing and milling operations. Semi skilled operator can operate the machine, in lieu of skilled operator. Reduction in wastage of roller material since it eliminates need for repeated chasing and meshing for the correction of errors. Faster chasing 15-20% time saving. Minimum downtime. ELECTRICAL : A composite and compact control panel is provided for easy operation of the machine. AC variator drive provided to select roller RPM to get desired cutting speed. BED DESIGN : High accuracy, hard chrome plated, longer life Linear Slides are used on the bed, saddle & cross slide assembly. No wear & tear as in cast iron bed. VERSATILE : SMART Axis can do chasing of CTC Rollers of all normal diameters upto 13" and upto 52" width CTC Machines.